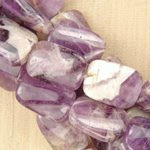 These polished beads have gorgeous earthy patterns combined with a rich purple color. All you need are Bali silver beads or spacers and the result will be a one-of-a-kind masterpiece. See our exquisite selection of gemstone beads.